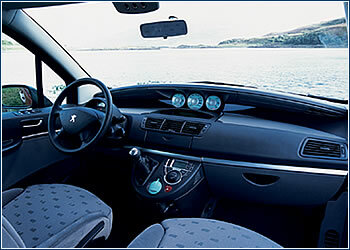 The elegant Peugeot 807 offers a spacious interior and unsurpassed comfort. 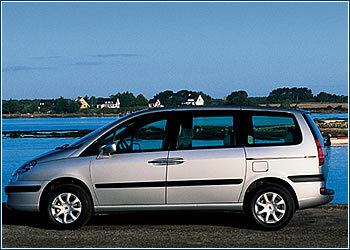 It is suitable both as a manager’s car and as the ideal vehicle for a well-heeled family. THIS HANDSOMELY shaped 4.73-meter long, 1.75 meter-high MPV category car stands out with its large glass body area and variable interior. In the more expensive Pack model the sliding rear doors on both sides are electrically controlled. Inside, you can change the number of seats and the ratio of passenger and luggage space in just seconds. When three rows of seats are installed in 2+3+3 configuration, the Peugeot 807 seats eight, or seven when the rear three-seat unit is replaced by two separate seats. Thanks to the patented Quickfix system, seats are easy to fold down or remove. With the Pack model both front seats can be turned around. With the luxurious Pullman model, six luxurious armchairs with armrests can be arranged in a 2+2+2 configuration. The short gearshift is located by the central panel of the dashboard, so it fits exactly into the driver’s hand. The hand brake lever is placed to the left of the driver’s seat, allowing for easy passage between the front and back part of the car. The Peugeot 807 with a 2.0-l, 100 kW (138 hp), gasoline engine and standard equipment sells for CZK 863,900, and with a 2.0-l HDI, 80 kW (108 hp) turbo-diesel engine sells for CZK 923,900. The richly equipped Pack goes for CZK 886,900 with a 2.2-l, 116 kW (160 hp) gasoline engine, and for CZK 1,067,900 with a 2.2-l HDI, 94 kW (130 hp) turbodiesel. The top of the line 807 features a 3.0-l V6, 150 kW (208 hp) gasoline engine and four-speed automatic transmission and sells for CZK 1,127,900.